If you’re keeping up with USB-C, you know there are a rising number of peripherals and cables coming out all the time. 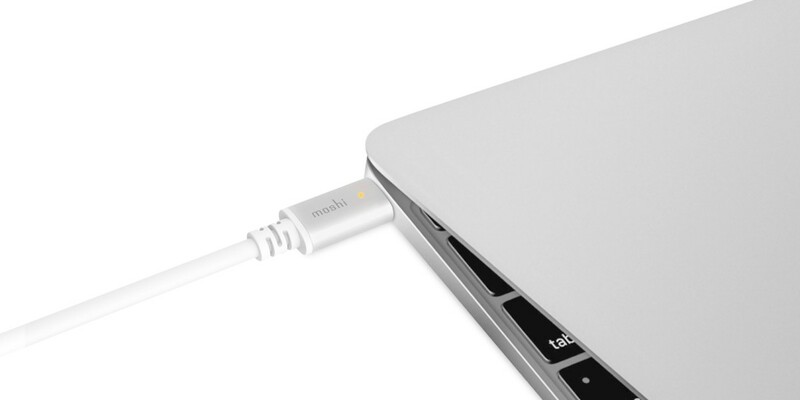 Moshi’s new Charge Cable for the MacBook may be the best of the lot, though. Though it may seem like any other USB-C cable, Moshi has actually put quite a bit of thought into theirs. Aluminum housing reinforces stress points, and it supports up to 60W power and USB 2 data transfer speeds. Perhaps the best part is the indicator lights that tell you when your MacBook (or other device) is fully charged. It’s a feature I didn’t really know I was missing in making the switch from the MacBook Pro to the MacBook. The Indicator lights are on both ends of the cable, too. And if you’re a cable organization freak like me, you’ll like that there’s an included wrap (though I quickly snapped that off and swapped it with my personal favorite). Those who’ve been keeping up with USB-C cables know that it’s hit-and-miss out there. A Google engineer has been randomly testing them and reviewing on Amazon so we know what’s good, but Moshi’s cable hasn’t popped up there yet. Moshi is an Apple-authorized MFi developer, Intel Thunderbolt licensee and USB-IF member, so all of our cables follow strict specifications. On the testing/QC side of our USB-C Charge Cable, we make sure each cable follows the USB-C voltage drop spec. If a cable doesn’t follow this spec and the voltage drop is too great then it won’t charge the connected device. We also use USB-C connectors with power and ground contacts that are long enough to ensure the correct power sequence. Cheaper USB-C connectors use less material so the contacts are shorter. If the power sequence isn’t correct, the product won’t function properly. In my time with Moshi’s USB-C Charge Cable, I’ve had no problems. It charges the same as Apple’s included cable (which is imperfect), and hasn’t hinted it was damaging my USB-C port at all as that Google Engineer notes some do (in fairness, he mostly tests USB to USB-C cables). For $34.95, it’s not a hard sell, either. It’s a sturdier, more feature-rich build than Apple’s cable, and has honestly made me wonder why this isn’t the cable Apple shipped with the MacBook. That alone has made it my default USB-C cable.